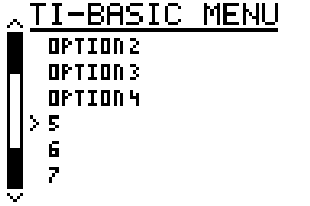 File Size: 970 Bytes A fully customizable, scrolling menu created for Codebender's custom menu contest. For however many options you want, each seperated by a comma. File Size: 4 Kilobytes pick which piece of info you have for the photon your studying and enter the value. remember to enter info like nano-meter as E-9. Combined size of both programs (when the assembly program had been compressed) is 262 bytes. File Size: 169 Bytes Have you ever wanted to get some of those pretty nifty ASCII characters, such as the arrows, or subscript numbers? Well with this program, you can! I recommend just sending this to your archive and running it with a shell (such as MirageOS) so that it does not get deleted, as the program stores its awesome characters into Str7! File Size: 235 Bytes This program looks at two waves of the form ASin(BX+C) and graphs their interference pattern. File Size: 6223 Bytes Tools to help in your Geometry or Trigonometry class, solving anything to do with triangles. 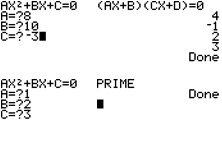 File Size: 2751 Bytes Oasis is a basic shell for your calculator that will run basic programs. File Size: 474 bytes Convert quickly and easily between any two bases from base two through base ten. File Size: 274 Bytes This program will simplify nearly any radical expression in the form of the nth root of x by removing the perfect n factors from under the radical. This program features very fast load times, index reduction, and imaginary simplifications.